Tatiana Calderon: "Gender doesn’t matter in this sport"
FIA Formula 3 European Championship driver Tatiana Calderon is one of few females racing in an established F1 feeder series, but she’s not interested in the hype that comes with her gender, as she tells Jamie Klein. Forty years have passed since Lella Lombardi became the last woman to take part in a Formula 1 race, and one of the hottest topics within the sport is when the wait for the next one to break through into a race seat will finally end. Among the most promising female racers with an eye firmly on making it at the highest level is Tatiana Calderon, now in her third season in European F3. But the perceived ‘need’ to have a woman in the Grand Prix field has never been something that has bothered her. “Your gender doesn’t really matter in this sport; it’s about you loving it,” she says over coffee in Farnham, a stone’s throw from the base of her Carlin team. "It’s always nice when you get messages from girls who say you’re their inspiration to start go-karting, but I’ve never really felt the need to motivate other girls to race. In an era increasingly dominated by sterile corporate identikit drivers, Calderon’s obvious passion and love for what she does is refreshing, her emotions clearly on display as she goes through the story of her career. 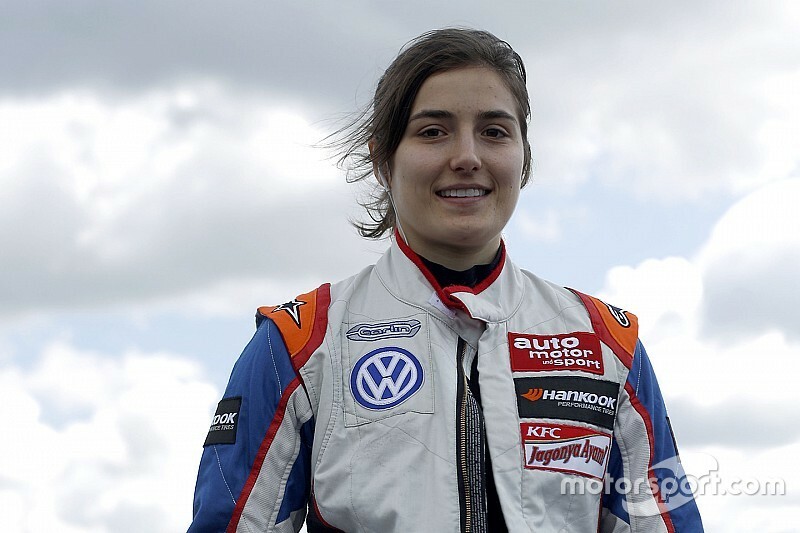 Inspired by her compatriot Juan Pablo Montoya to take up go-karting at nine-years old – she was first introduced to it by her older sister Paula, who later gave up her racing career to focus on her studies – Calderon soon found herself winning both in her native Colombia and in the United States. From there, she relocated to Indianapolis to race in the US-based Star Mazda series, and by the end of her second season was in talks to step up to Indy Lights before making the decision to turn her back on the IndyCar ladder and move to Europe. “I never particularly liked ovals, and I remember my dad and I were sitting in the airport when the news broke that Dan Wheldon was killed,” she recalls. A season in European Formula 3 Open with Emilio de Villota’s team ensued, but Calderon soon realised that stiffer competition would be required to hasten the learning process, signing with Double R Racing to do parallel British and European F3 campaigns in 2013. She became the first and only woman to stand on the podium in the British series at the Nurburgring, but the total inexperience of the team in the European series and of its Hankook rubber made her first year in the category largely one to forget, failing to score points all season. 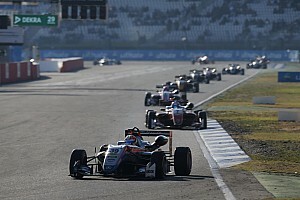 “I never thought it would be so tough to step into European F3 – I was really surprised by the level there,” she says. “But that’s how you get better. It was a tough year, but I learned so much. 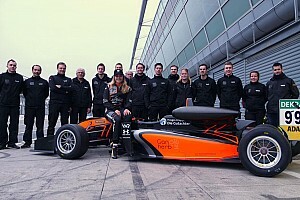 Calderon initially signed with the Signature squad for her second European F3 season in 2014, but upon realising any chance of being competitive would be killed off by a gutless Renault engine, a late deal was struck to race for Mucke Motorsport in a car prepared by Jo Zeller Racing. Following a difficult start to the year, she became a regular presence in the points in the latter half of the year after a breakthrough fifth place in Spa gave her a timely confidence boost. 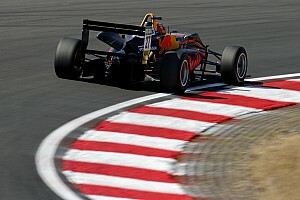 Calderon wound up a respectable 15th in the points at the end of the season, and had her sights set on being inside the top 10 this season stepping up to join single-seater powerhouse squad Carlin. But things have proven far harder than expected, the 22-year-old yet to get herself on the scoreboard after four rounds. Bad luck has played its part – she was hit by other drivers at Hockenheim, Pau and at the crash-strewn Monza round – but she admits qualifying is an area where she needs to step up her game. Calderon’s best finish of the campaign so far, a 14th place, came in the final Monza race that was called off by the stewards in response to dangerously bad driving standards that caused terrifying airborne accidents for Lance Stroll and Michele Beretta. Reflecting on an embarrassing weekend for F3 in particular, and for the sport in general, she doesn’t pull any punches, pinning the blame for the carnage on the desperation of certain drivers to prove themselves and the reluctance of the stewards to penalise the worst offenders. “I don’t think the organisers were right to call off the last race,” she insists. “They made a mistake by not penalising bad behaviour, and there were too many safety cars which just bunches everybody up again and makes thing worse. Looking towards the future, Calderon says she has little to learn from another season in F3, and that a change of scenery is on the cards for 2016. She’s already tested in GP3, believing the more powerful, less downforce-dependent car to suit her driving style better. Asked if she could foresee herself following in Wolff’s footsteps and racing in DTM, Calderon admits: “I wouldn’t be able to say no to a DTM seat, but it isn’t going to be offered to me just because I’m a female. Would she ever consider returning to America where it all started, particular given the recent success of her idol Montoya in IndyCar? If there’s one form of racing in which Calderon has no interest whatsoever, it’s Bernie Ecclestone’s proposal of a female-only championship. It’s clear Calderon relishes competition, the need to constantly improve and measure herself against the very best – which is why her gender is of secondary importance as she continues to pursue her dream of one day racing in the pinnacle of motorsport.